This race was my first ultra, back in 2011, and it has grown from a field of just 19 when it started in 2009. It’s always a friendly event and nice to run a course without navigation so I was keen to do it again! 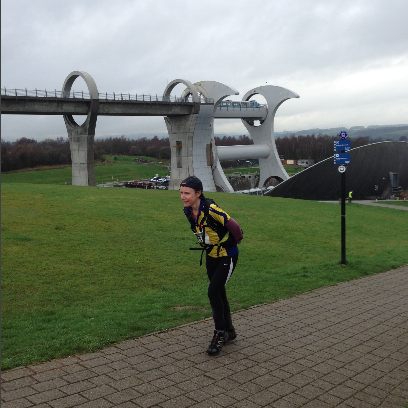 The first 22 miles is along the Forth-Clyde Canal to Falkirk where a very short climb at the iconic Falkirk Wheel takes you up to the Union Canal and – 33.5 miles later – Edinburgh. ViewRanger trace of the route. 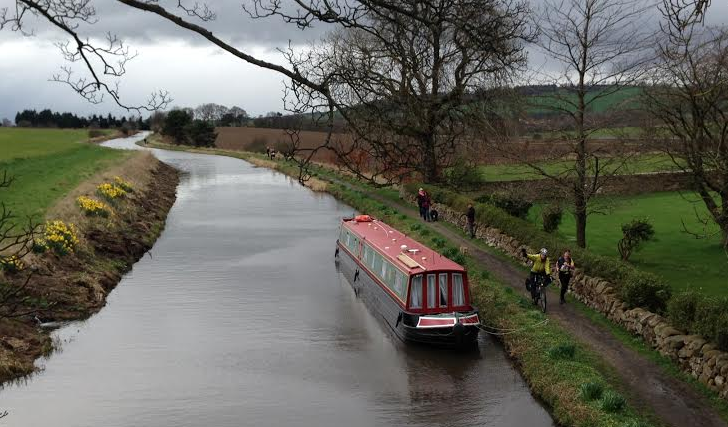 You are running west to east all day – as they say at the Start, if the canal isn’t on your right, you’re lost! We had a hotel booked in each city, and arrived at Glasgow’s Ruchill Park at 8:30 for a 9am start. 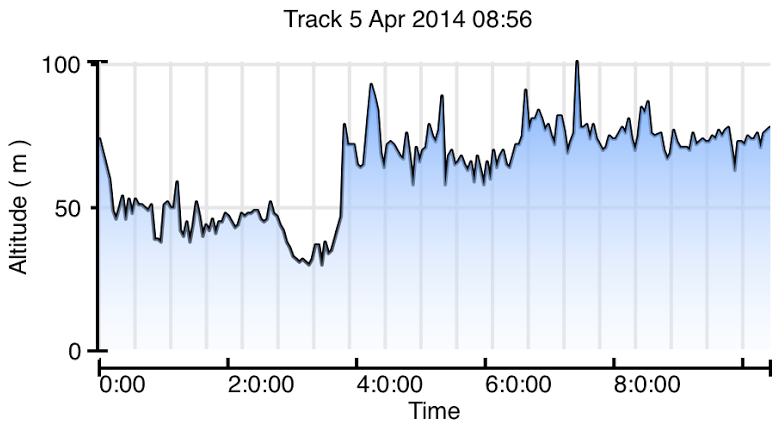 People seemed to go off quite fast, as born out by my 1hr 55 split for Auchinstarry at 13.1 miles, the 1st checkpoint. It was quite wet and muddy along the towpaths but my brother came up on the train with his bike to pace me and this was a real boost, as well as having Dave and veteran flask-opener and boiled-egg-peeler Sarah at all the checkpoints and lots of bridges! Towpath monotony. Sometimes you can see fluorescent dots of other runners ahead of you but most often not! 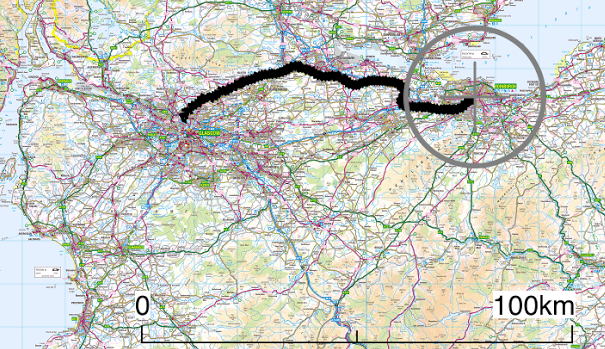 Altitude profile – basically shows the Union Canal is a bit higher than the Forth-Clyde! 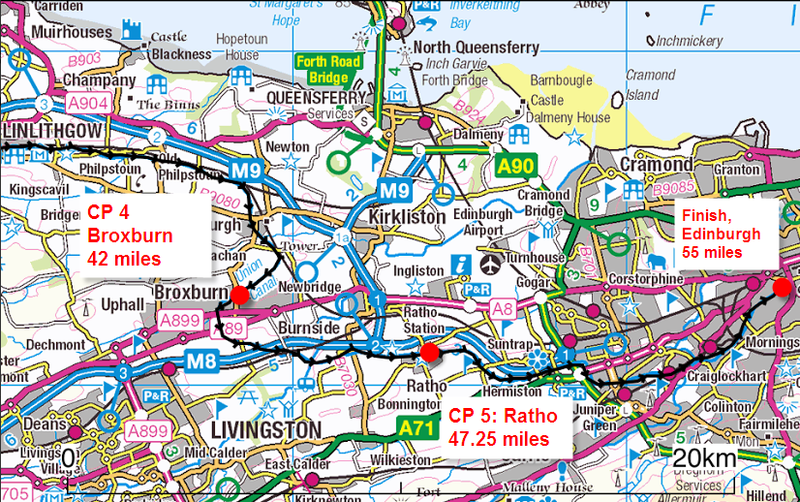 Falkirk is the psychological half way point at 22 miles, partly because you can have a bag taken there by the organisers. But actually it’s 6 miles before half-way, which is an hour’s running! I got to Falkirk at 12:30 (exactly same time as 2011) and had a pie, coffee and cake. Ten minutes sit down – the longest in the race but well worth it. Then a walk up the hill to start the 11.5 mile slog to Linlithgow. There are 2 long tunnels at the start of this section and the lovely Almond Aquaduct towards the end. I kept going, the sun came out, and John caught me up on the bike so I got to Linlithgow at 14:45, just 5 mins ahead of my 2011 time. 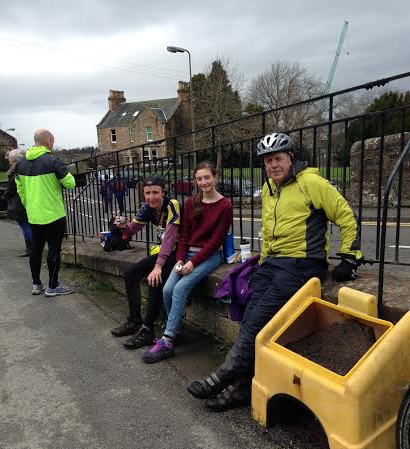 Had a wrap, a Redbull and some coffee at the pretty Linlithgow checkpoint and off again. The sections are shorter from here and there’s a feeling that it’s in the bag, even though there’s still 22 miles to go! John cycled ahead after Broxburn to catch his train home from Edinburgh, and Sarah and Dave intercepted me at several bridges between there and Ratho. 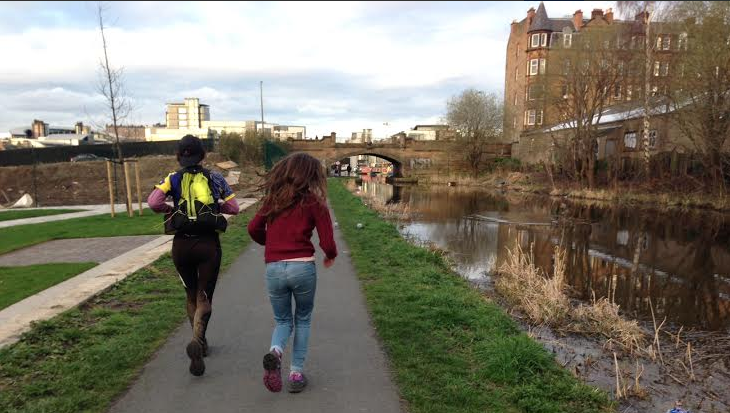 After seeing me at Hermiston they went to check in at the hotel, then backtracked the route from the Finish at Edinburgh Quay, meeting me about a mile out. I’d managed to carry on running all the way so my time was almost an hour faster than 2011 and I was delighted to finish 62nd in a time of 10 hours 10 mins, and even more delighted to stop running! Next time I do this, it’ll be in a barge!! Link to Resolute Events homepage and Results. 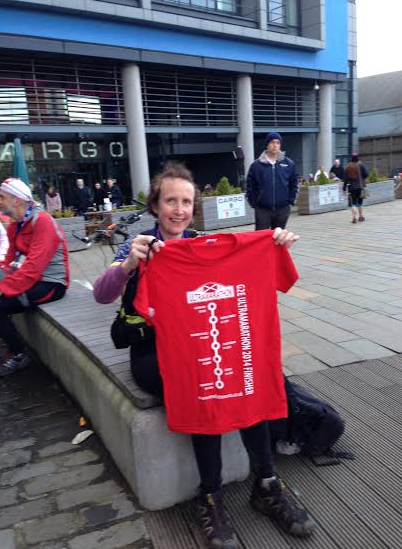 Proudly sporting medal and T shirt!